This coming February, Thao & the Get Down Stay Down's 2013 album We the Common will be turning three years old. Not long after that, the band will return with a North American tour in support of a new album. The details of the forthcoming LP haven't been confirmed yet, but songwriter Thao Nguyen and her band have shared a trailer containing a snippet of danceable indie rock and along with dynamic visuals that mix candid studio footage with Asian city scenes. The album is due out in spring 2016, and Nguyen confirmed on Facebook that they "just finished" the LP. Speaking of spring 2016, that's when Thao & the Get Down Stay Down will hit the road in North America for a month-long tour. The bulk of the dates are in the U.S., but there are Canadian stops in Vancouver on March 27 and Toronto on April 9. Saintseneca will open up a number of the shows, while other ones (including the Toronto date) are with Little Scream. See the schedule below, and the new album trailer below that. 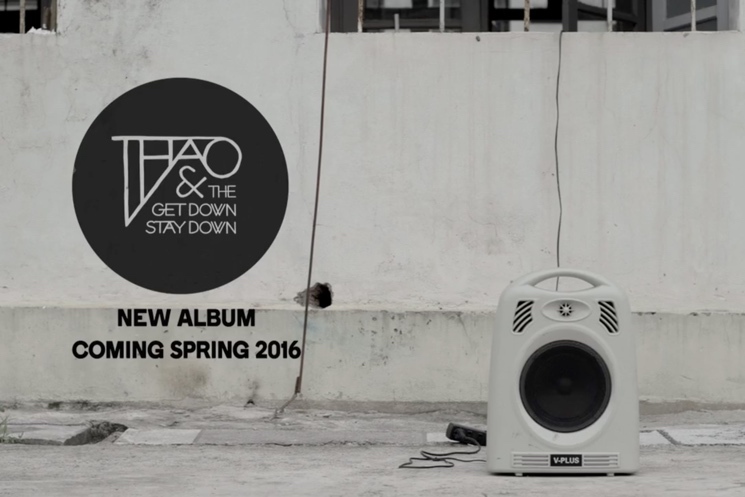 Stay tuned for a proper album announcement from Thao & the Get Down Stay Down.